US Momentum Strategy: a blueprint for investment success. This is a custon-built tool for retail investors wanting to safely invest in the top 500 US stocks without suffering huge losses like those seen during the GFC. What does it take to pursue exceptional results? And to sustain them for the long term? It takes an intense curiosity which stems from original thinking and a refusal to blindly accept statistical models, economic theories, and even “common wisdom” prevailing within the investment industry. The following equity growth chart shows the US Momentum Strategy and the S&P 500 from January 2007 through December 2013. When the GFC started in mid-2007 the US Momentum Strategy went to cash whilst Buy & Hold investors suffered losses exceeding 48%. When upward market trends began again in early 2009 the strategy started investing automatically. This seemingly minor strategy enhancement not only saved investors significant pain and suffering, but also ensured their returns were significantly higher. Indeed, during this small window the strategy returned +13.4% p.a. vs. the S&P 500 return of +3.8% p.a. Markets, and specifically individual stocks, manifest themselves in trends. While trends do not exist in all stocks all of the time, they do exist in most stocks some of the time. Simply put, directional price momentum tends to persist long enough for our models to exploit and capitalize on. The US Momentum Strategy is based on three core pillars curated from decades of research and experience. By applying these principles, we seek to deliver sustainable, long term capital growth for our clients. It can be argued that markets operate in two modalities; trending and mean reversion. 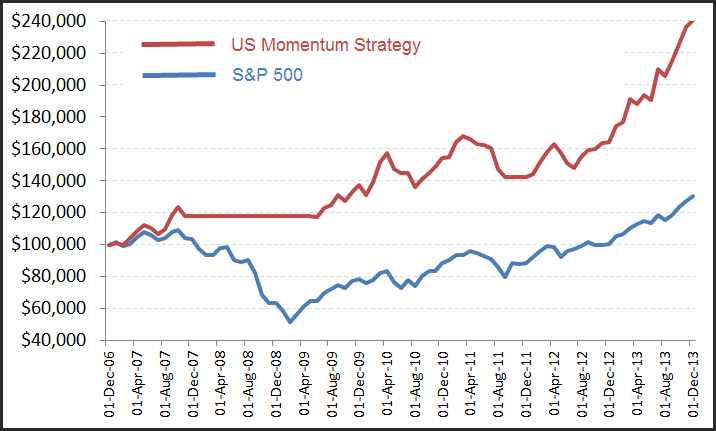 The US Momentum Strategy is designed to capture upward price persistence, or trends. The momentum anomaly says that what was strongly going up in the past will probably continue to go up in the near future. The main reasons for anomaly persistence are behavioral biases like investor herding, investor over and underreaction and confirmation bias. Another natural interpretation of momentum profits is that stocks underreact to information. For example, if a firm releases good news and the stock price only reacts partially to the good news, then buying the stock after the initial release of the news will generate profits. Countless academic studies show strong support for momentum effects. A defined set of rules govern the full investment process from the entries and exits, to position sizing and portfolio construction. One of the most significant benefits of systematic trading is that it helps to remove emotional decision making from the trading process. When real money is at risk in the markets, the emotions of fear and greed can easily overwhelm rational decision making. This can be mitigated to a large extent by having a trading strategy that makes the decisions for you. Another benefit is that it can be tested on historical data. Back-testing not only tells you how well the strategy would have done in the past, it can be very helpful to understand what can potentially occur in the future. Understanding the strategy metrics allows the user a certain degree of comfort in knowing if the strategy is promising or not. The US Momentum Strategy is a complete service. As a Member you will not only receive buy and sell signals, but we also provide you with position sizing and portfolio construction. There is no need for additional expensive software. In fact, as a member you will receive a complimentary copy of our Share Trade Tracker portfolio software so you can keep updated and informed about your portfolio's progress. Lastly we pride ourselves in trading right alongside our members and the US Momentum Strategy is no exception. As the owners of the business we've put our money where our mouth is and will experience the same performance - good and bad, as our members. The US Momentum Strategy trades once a month. In the interim there is absolutely nothing you need to do except sit back and allow the strategy do what it's designed to do. Give it a go. Click the link below to get started today. This webinar was filmed in 2015 so whilst prices and broker details may have changed the details of the US Momentum strategy are still relevent.